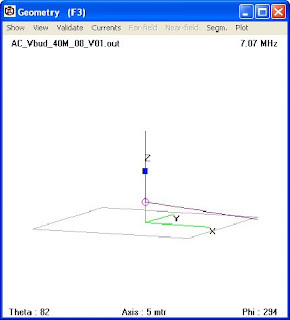 I have found a way to post my 4NEC2 Buddipole modeling files on line using Google Documents. Eventually I will log many of my design files here for anyone to use. Below is a list of the files I have created. Description, LongWhip with RedCoil and 4 Dipole Arms on VersaTee w/ TRSB set to 25ohms (2:1) and 1 8.6m Counterpoise. 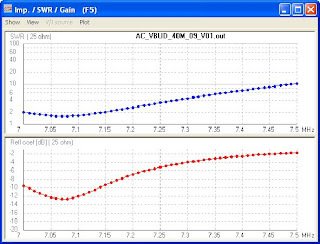 Moving the red coil to below the dipole arms, resulted in a modest loss of antenna gain from 0.6dBi to 0dBi, the take off angle remained the same at about 30degrees. The inductance needed to maintain the antenna at resonance (7.07MHz) was reduced from 15uH (18 turns form the bottom) to 10uH (25 turns from the bottom). 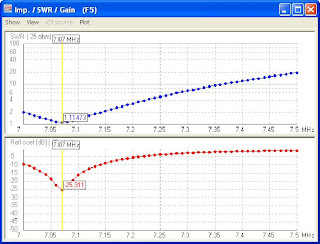 Best case SWR was increased from 1.1 to 1.6 as the impedance of the antenna decreased from 22.5ohms to 15.6ohms. Overall, I would take from this, that is it better to not have the coil placed adjacent to the feed point.